Last weekend Drum Corps International headed to the Indiana State School Music Association (ISSMA) State Finals at Lucas Oil Stadium in downtown Indianapolis. The annual marching band competition included performances by some of the top Indiana high school groups. 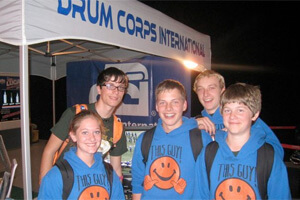 Those stopping by the DCI fan tent in the Lucas Oil concourse had the opportunity to check out information about the 2011 drum corps audition season, watch the brand new 2010 World Championship DVDs, and learn more about the ISSMA Fan Network. The new online video platform, which is powered by Drum Corps International, is currently featuring all of the performances from the Saturday, Oct. 30 event. View photos from the ISSMA State Finals on Facebook. Check out the ISSMA Fan Network.